For the 2nd year in a row, Asia Society Philippines, together with Federation of Indian Chambers of Commerce, SingIndia Music of the Soul, and Indian Ladies Club, are bringing the HOLI experience to Manila on March 16, 2014 at SM Mall of Asia by the Bay. Holi Festival is uniquely characterized by the throwing and applying of colored powder or gulal. 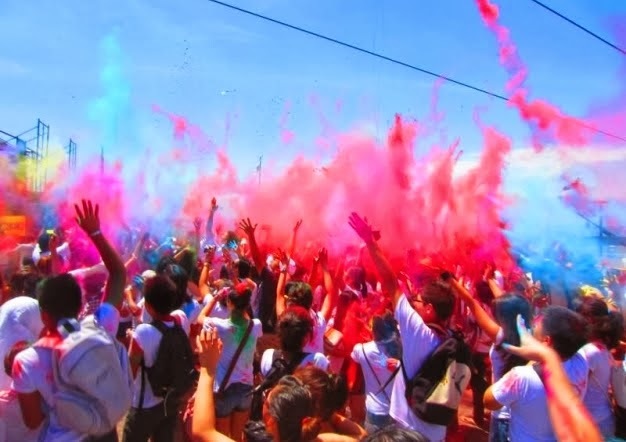 Hundreds of people gather on the streets to throw colored powder, play instruments, dance, and participate in merrymaking activities. Because of its popularity, Holi is celebrated in more than 20 countries across five continents - Asia, Europe, Africa, North America, and South America. Aside from the color play, Holi goers in Manila can look forward to a nonstop show featuring Bhangra, Bollywood, and Belly dancers, various singing acts, drummers, and a live DJ from 4:00-8:00PM. There will also be games, Indian food booths, and the opportunity to sample traditional Holi delicacies such as thandai. A spring festival, the bright colors of Holi mimic nature’s vibrant display. The color play is also a commemoration of the great love of Krishna and Radha, hence Holi is sometimes known as the Festival of Love. Young Krishna, with his dark complexion, applied color on fair-skinned Radha to make her look like him. The throwing of gulal up in the air and at each other symbolizes friendship, unity, and a sense of revelry. During Holi, there is no distinction between age, race or class. Enemies, friends, and strangers alike come together to celebrate this joyous festival. A common saying heard during Holi is “Bura na Mano, Holi hai!” (Don’t feel offended, it’s Holi!). Holi Festival 2014 is supported by New India Assurance, Jockey Philippines, and Pepsi Cola, with special thanks to RK Manufacturing and Serena Enterprises. Solar News Channel, ABS-CBN News Channel, Hinge Inquirer Publications, and Rappler are media partners for the event. Tickets are now available at a pre-selling price of PHP 150, and can be bought on site for PHP 200. Tickets include entrance, colored powder, and samples of traditional Holi delicacies. For ticket inquiries and more information, contact info@asiasociety.org.ph or 550-2612.